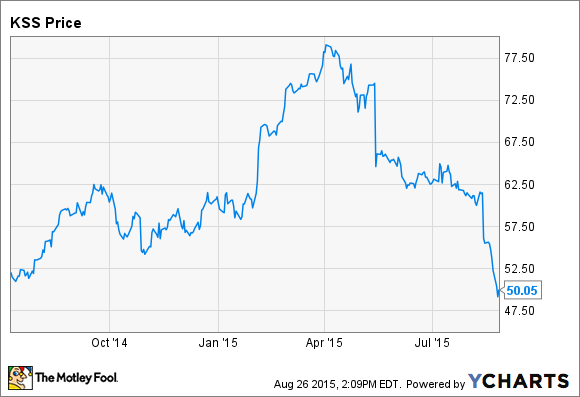 After a big decline in its stock price, Kohl's should be on every value investor's radar. About a year ago, I wrote an article extolling department-store operator Kohl's (NYSE:KSS) as a good value opportunity. The company was facing its fair share of issues at the time, with both comparable-store sales and profits declining, but assuming that these were temporary problems, the stock was too cheap to ignore. Shares of Kohl's rose by about 50% over the following nine months, but disappointing earnings coupled with the recent market turmoil have erased all of those gains. Kohl's is now back in bargain territory, and while the company still has work to do, the situation has improved over the past year. Here's why Kohl's is once again a buy. That doesn't mean Kohl's is in the clear, but there has been a significant improvement in the company's results over the past few quarters. It appears that the worst is over for Kohl's, but the holiday season will be the real test of whether the company's recovery has legs. In the second quarter, net income declined by a staggering 44% year over year, but this number includes a charge Kohl's took to extinguish some debt. Kohl's recognized a $170 million loss related to debt refinancing during the second quarter, which drove down the company's net income. Adjusting for this charge, net income declined by just 9% year over year, with EPS falling by a smaller 5% thanks to share buybacks. Now, earnings declines of any size are certainly something to be concerned about. During the second quarter, gross margin fell by 10 basis points year over year, and operating expenses as a percentage of revenue rose by half a percentage point. This drop led to a lower operating margin of 9.9%, compared with 10.6% during the second quarter of 2014. Continued sales growth can largely correct the problem. During the fourth quarter, when Kohl's posted comparable-store sales growth of 3.7%, the operating margin expanded year over year thanks to lower operating costs as a percentage of revenue. Revenue is still below peak levels, so if Kohl's can continue to grow sales, the company's profitability should improve. Kohl's expects full-year EPS between $4.40 and $4.60, excluding the charge related to extinguishment of debt. This range puts Kohl's current stock price at just 10.8 to 11.3 times expected earnings. Kohl's doesn't need much growth at all to justify that valuation. *OpEx excludes one-time charges for J.C. Penney. J.C. Penney is growing the fastest out of the three, but the company suffered a massive sales decline a few years ago, and its revenue is still substantially depressed. J.C. Penney is still not profitable, posting a net loss of $138 million during the second quarter, and the company's roughly $400 million of annual interest payments will make the climb back to profitability a difficult task. After years of solid growth, Macy's has hit a snag, with a comparable-store sales decline during the second quarter. Its forward P/E ratio is a bit higher than that of Kohl's, but the company was able to maintain its earnings guidance after a disappointing second quarter only because it previously hadn't included a $250 million expected gain from the sale of real estate. Backing that out, earnings are in danger of declining this year at Macy's. Gross margins for all three companies are in the same ballpark, but Kohl's manages to do more with less, operating its stores more efficiently as it spends a lower percentage of revenue on operating expenses. J.C. Penney has been cutting costs, but it's still a long way from the efficiency of Kohl's. In addition to selling at a great price based on earnings, Kohl's stock has quickly emerged as a solid dividend payer. Kohl's dividend dates only to 2012, but thanks to the steep decline in the stock price, the dividend yield has reached about 3.66% based on the company's most recent payment. Dividend payments will total $1.80 per share over the next year, barring a dividend increase, putting the payout ratio based on earnings estimates at 39% to 41%. Because Kohl's generates so much free cash flow -- about $1.34 billion during 2014 -- the company is able to buy back quite a few of its own shares in addition to paying a sizable dividend. The share count has declined by about 50% since the end of 2010, and Kohl's continues to spend heavily on buybacks, shelling out $543 million during the first six months of this fiscal year. The company's debt has increased over the past five years, but its debt levels appear reasonable, with interest expense eating up a bit less than 20% of operating income during the second quarter. Kohl's is in a better position than it was a year ago, with comparable-store sales growing, and it's become a solid dividend stock, with a high yield and a relatively low payout ratio. Kohl's is once again on sale, and among its immediate peers, it's far and away the best value.